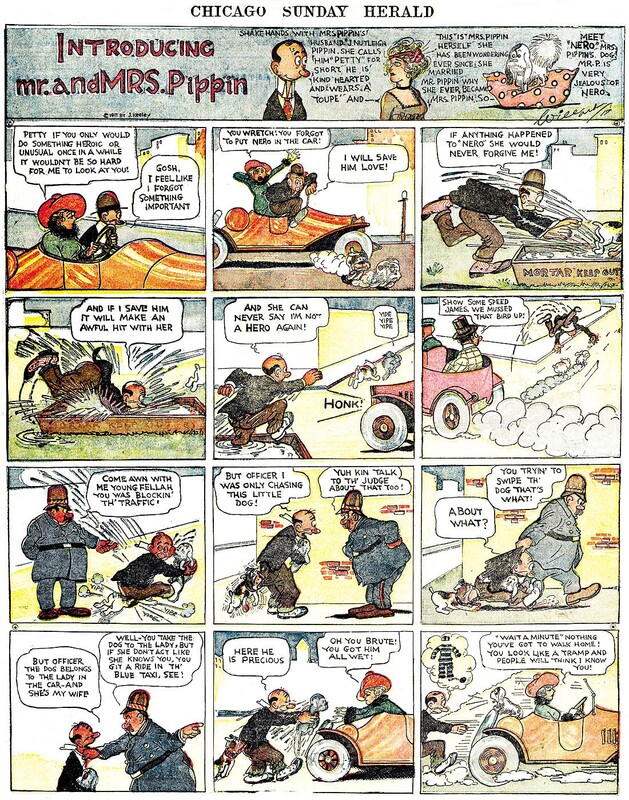 Friday, February 21 1908 -- Herriman takes a break from boxing cartoons for a day and heads out to Santa Anita racetrack to make some sketches of the colorful horsey crowd. 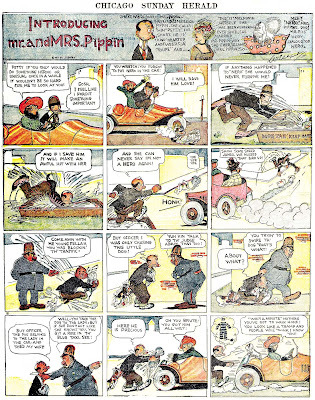 Herriman also keeps the Hen Berry weasel-skin hat story moving along, now clearly off in the realm of fantasy. John Paul Arnot, native of Markleeville, and former resident of Reno, died in San Francisco, recently after a long and successful career as a cartoonist, an funeral services were held in that city early this week. 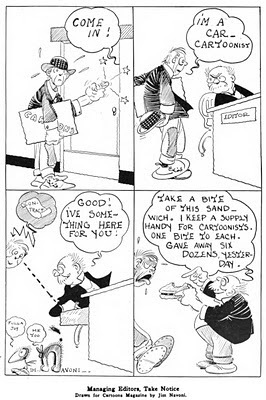 Mr. Arnot's career as a cartoonist started soon after he left the University of Nevada in 1907, and during the intervening years it covered a wide variety of activities. He was born at Markleeville, where his father, N.D. Arnot, was an attorney, and the family later moved to Placerville when the elder Mr. Arnot was named judge for that district. John Paul Arnot came to Reno to attend the University of Nevada, where two sisters and a brother already had graduated. Another brother, Percy A. Arnot, attended college in California, and is now a physician and obstetrician in San Francisco. In his college days, Mr. Arnot's skill with pencil and pen were recognized. 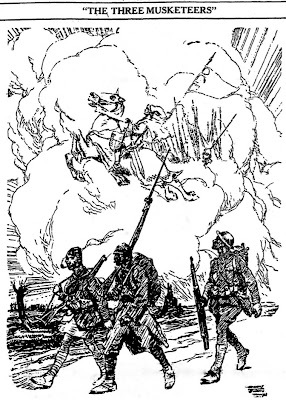 He and Silas E. Ross were chosen to publish the 1908 Artemisia, with Mr. Arnot making the cartoons and art work, and Mr. Ross writing most of the text and supervising the editorial work. Mr. Arnot did not graduate from Nevada, but went to San Francisco where he became a cartoonist on the Hearst newspapers. Later he and some of his workers formed their own feature syndicate. 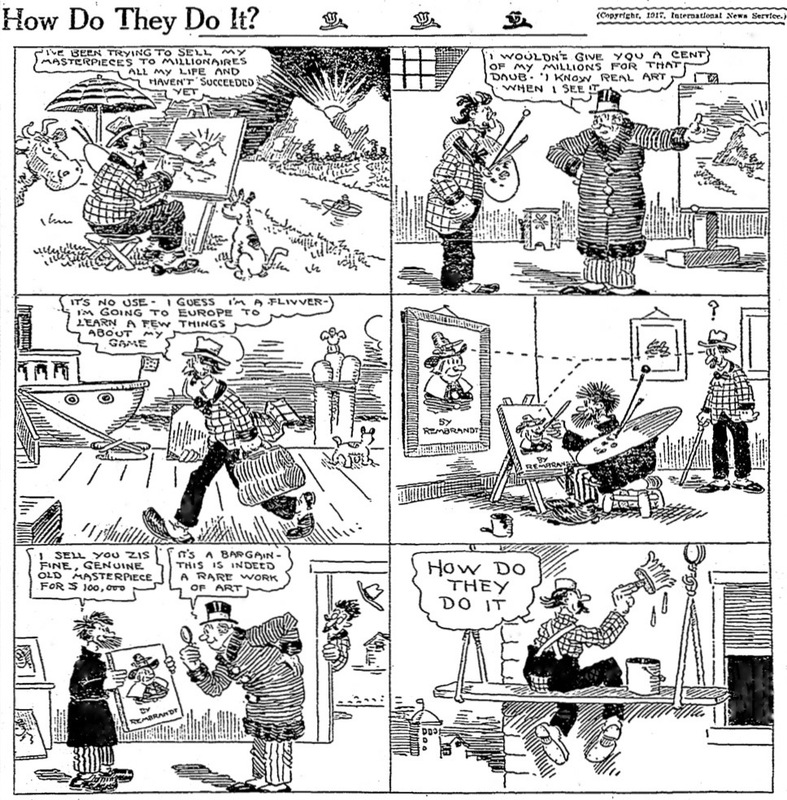 In 1913 he worked for the San Francisco Chronicle as sports cartoonist, then returned to the Hearst organization by joining the King Features syndicate, working in the east for a number of years. He returned to the west coast in 1933 as sports cartoonist for the San Francisco News, and a year later became associated with Eastman Kodak Co. in San Francisco. Surviving are his widow, Mrs. Hope Beach Arnot; a son, John Philip Arnot; two sisters, Mrs. May Arnot Rice, who graduated from the Nevada university in 1900, and now resides in Berkeley; Mrs. Laura Arnot Leavitt, member of the Nevada class of 1904, and now living in San Francisco where she operates a women's wear store; three brothers, Stanley L. Arnot of Sonora, Calif., Nathaniel D. Arnot and Dr. Percy Arnot of San Francisco. Another brother, the late Edwin P. Arnot, graduate of the University of Nevada in 1902, was a mining engineer. [John Paul Arnot was born in Markleeville, California on September 16, 1887, according to his World War II draft card. In the 1900 U.S. Federal Census, he was the fourth of eight children born to Nathaniel and Anna. The family lived in Markleeville. His father was a superior court judge. In 1910 the family lived in Placerville, California on Nob Hill. Arnot was a miner. 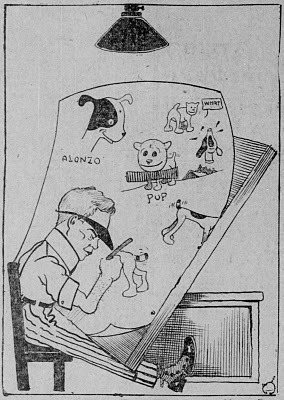 The Mountain Democrat (Placerville, California) reported Arnot's cartooning success on February 14, 1914. John Paul Arnot, son of Judge and Mrs. N.D. Arnot, is making quite a reputation as a cartoonist on the San Francisco Chronicle, where he has been employed for some months past. In the issue of the journal of Sunday Feb. 8th, young Arnot presented a full front page with cartoons summing up in comic style various news features of the week, and it was certainly a cleverly worked out scheme of burlesque and pointed criticism. Placerville is proud of the young genius—who claims this as his "home town." On August 18, 1915, Arnot married Hope Beach, according to the Mountain Democrat on August 21. The newlyweds moved to New York City, where he worked for King Features Syndicate. Later, he registered for the draft. 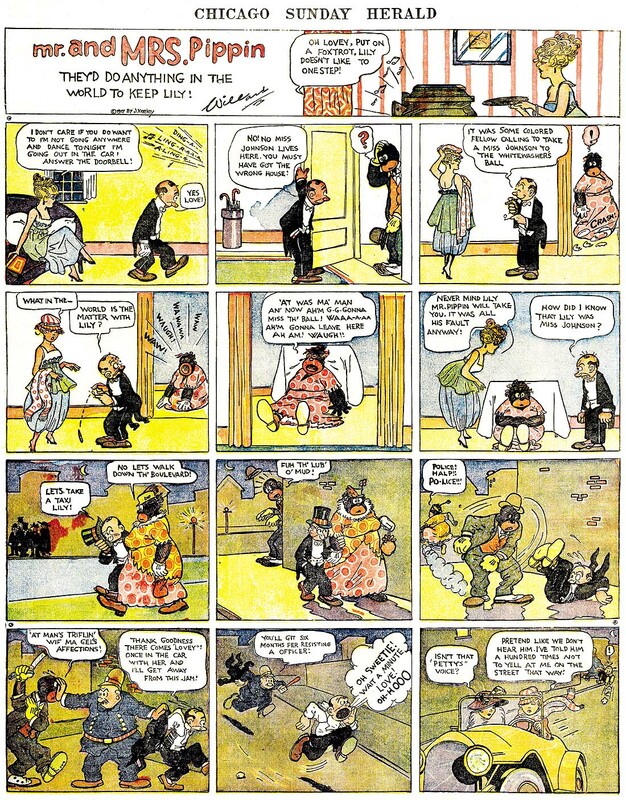 According to Lambiek Comiclopeida, his strips, this decade, included Old Doc Gayboy (1913-1914), And So It Goes (1916), Sinned-Against Samuel (1916), Miss Pippin (1917), That Squares It (1918-1919), How Do They Do It? (1917–1927) and The General (1919–1922). In 1920 the couple lived in Placerville at 66 Mill Street. He was a cartoonist. In a couple of years they returned to New York City. 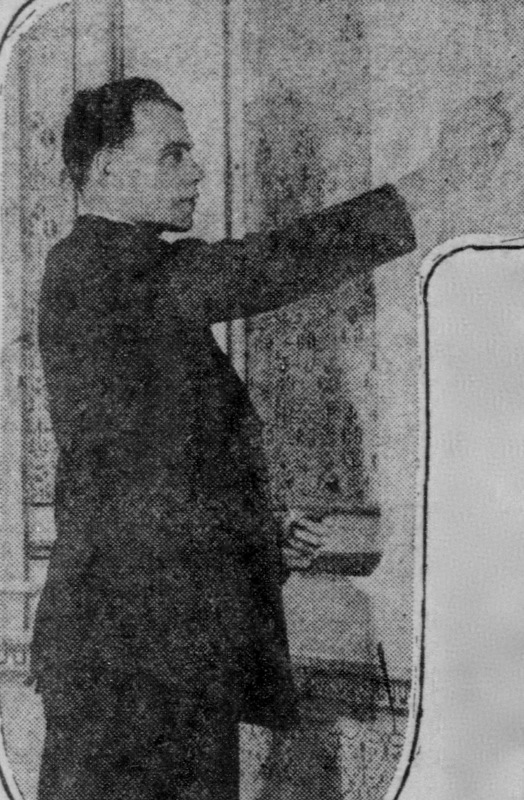 Arnot produced Helpful Henry from 1925 to 1926. The 1930 census recorded them and their son in Manhattan at 220 Northern Avenue. Arnot's occupation was newspaper cartoonist. A few years later they made their home in San Francisco. Single women more and more were making their presence felt in the workforce in the 1910s, and strips about their experiences in the working world were starting to pop up. By the 20s and 30s they were well on the way to being a comics page staple, but in the 1910s J.P. Arnot's Miss Pippin, the tale of a lady school principal, was still at least a little bit of a novelty. Better yet, Hearst bullpenner Arnot didn't react to the continued rise of women's rights advocacy in the 1910s as most of the male breed did, with indulgent sugar-coated derision. Arnot's strip didn't make fun of this working woman the way most did. The typical jokes about women having no head for business, being too frail of spirit and too tender of heart to survive in the world of men were seldom used in Miss Pippin. Arnot's protagonist was portrayed as an intelligent and resourceful woman who effortlessly turns aside male chauvinism with her demure good manners and wit. Perhaps newspaper readers in the 1910s weren't ready for this 'foremother' of Brenda Starr, because the strip didn't run for long. 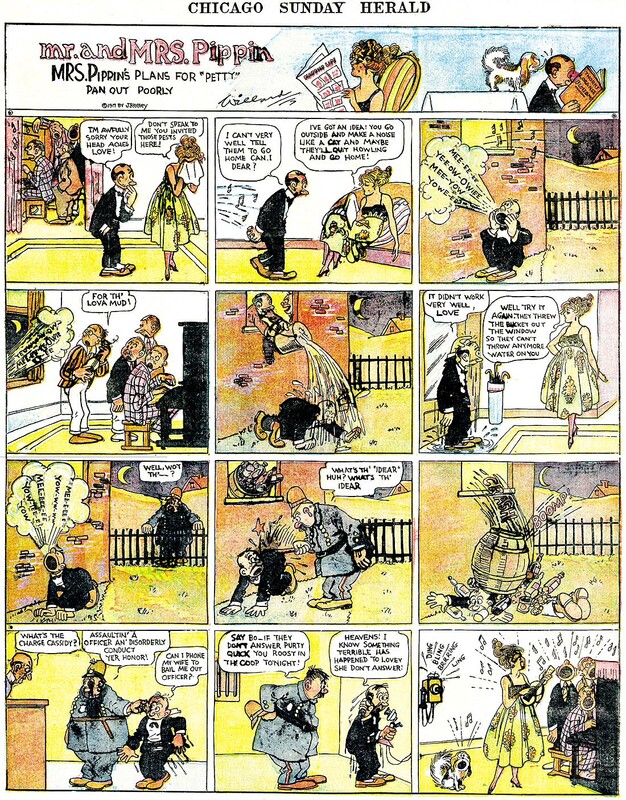 Hearst strips from the latter half of the teens are devilishly hard to track, but I believe the strip began on September 29 1917 and seems to have sputtered out by December of that year. I have yet to find a paper that printed the strip on a consistent daily basis, so it may have been one of the last of what I term 'weekday strips', daily-style strips that were not issued on a regular 6-day per week basis. If anyone has located a true daily run of it, please let me know. Before Frank Willard hit it big with Moon Mullins, he was a productive staffer at the Chicago Herald. The Herald had visions (more like delusions) of grandeur with their comic strip offerings, which were offered in syndication to few takers. Although they did have some good material to offer mixed in with the bad, the cartoonists were mostly kids, and there was no firm editorial hand to guide the neophytes. There was also an unfortunate lack of attention to printing quality. You can see the terribly off-register color, the type lice and the ink blotches in the samples above. I spent a lot of time cleaning these up so that at least the word balloons are legible -- they were just masses of type lice before I took the virtual scrub brush to them. What does shine through on these samples very clearly is that Frank Willard, long before Moon Mullins, was already fascinated with the comic possibilities of the lower classes and the seamy underbelly of life. These strips are very raw-boned and tough-minded, with Willard giving no quarter to the miserable and most likely cuckolded Mr. Pippen. His wife is a tart, a brat and a harridan with no redeeming qualities. The cops, who figure large in their misbegotten marriage, are arrogant and moronic. In short, the strip is uncomfortably realistic -- played for laughs like a funhouse reflection, but leaving the reader with the troubling sensation that Willard knows whereof he speaks. Mr. and Mrs. Pippen ran in the Chicago Herald starting on April 1 1917, and ran through April 28 1918. The title changed to Mrs. Pippen's Husband on July 1 1917. 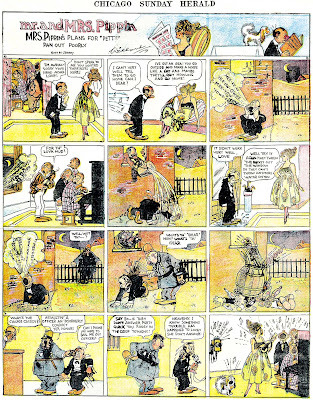 The strip was sold by some outfit in reprints, as I've found it running in the Ogden Standard in 1919. Notice in the second example Lilly's gloves disappear and reappear. In the third, Mrs. Pippin reads a comic section with DeBeck's other Keeley strip, "Married Life". The final date must have extra significance as the J.Keeley syndicate and the Chicago Herald only had a few weeks left when the Herald was merged with Hearst's Chicago morning paper to form the Herald and Examiner. Seeing some samples of the Ogden Standard from about that time, I assume World Color Printing may have been the ones to recycle the Keeley strips, just as they had with the leftovers from the Philadelphia syndicates. That Mrs. Pippin sure is a full-on shrew, isn't she? She makes Maggie from BRINGING UP FATHER look like Mother Teresa by contrast! James Angel "Jim" Navoni was born in Napa, California on November 18, 1887, according to the California Death Index at Ancestry.com. In the 1900 U.S. Federal Census, he was the oldest of four children born to Bert and Mary, both Italian emigrants. The family lived in Napa where his father was a farmer. In Artists in California, 1786-1940, Edan Hughes said, "While in San Francisco in 1907-11, Navoni studied at the Institute of Art." Navoni attended the University of California, Berkeley in 1908; his name was found in the yearbook The Blue and Gold. According to The Call (San Francisco, California), he was a contributor to the school paper, Pelican, as reported on September 25, 1909. Berkeley, Sept. 14.—Editor G.J. Adams of the Pelican, the comic paper of the students, has announced his staff for the publication, which on Friday will make its first appearance for the term replete with cartoons and satires. Adams will be assisted by H.E. Mills and James Navoni as associate editors…. Navoni found work at the The Call; he was one of several artists to work on the local strip Alonzo. The paper promoted its children's section, The Junior Call, with a party, as reported on April 11, 1912. ...Artist Jim Navoni, who draws Alonzo and the Pup and their funny doings in The Junior Call every Saturday, will be there with large sheets of paper and plenty of charcoal pencils. And between Mrs. Olsen's great stories Artist Navoni will make motions on the paper with his charcoal, and lo! there will be Alonzo and the Pup smiling at the youthful audience. …there were two interesting features, one being the piano solo by Stefan Vucosavlievich, the boy pianist. The other was furnished by James Navoni, the clever Junior Call artist, whose pictures of Alonzo and The Pup are known from one end of the juvenile San Francisco to the other. Navoni, in the interests of Alonzo and his small brother, who unfortunately were unable to attend in person, presented their regrets and drew their smiling faces on an improvised board, much to the delight of the assembled audience…. 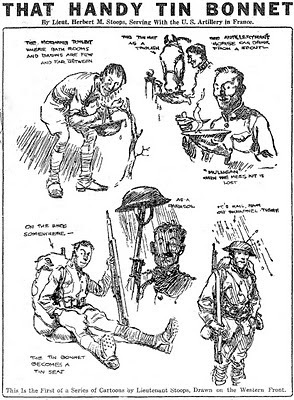 Cartoons Magazine, March 1916, published news of Navoni's whereabouts. James Navoni, formerly of the San Francisco Call, has for several months been in the employ of a travelogue concern, and has been zigzagging here and there across the country. "During my travels," he writes, "it has been my good fortune to come into contact with people of all types and classes. You can't deny that Mr. Knock-about-a-bit is quite a valuable teacher. At any rate, he has helped me toward a better understanding of human nature, the cartoonist's greatest assets." He signed his World War I draft card on May 29, 1917. He resided in Napa and his occupation was cartoonist. The description of him was tall height, medium build with brown eyes and hair. The date of his move to Chicago, Illinois is not known. The 1920 census recorded Navoni, a lodger, in Chicago at 61 Delaware Place. His occupation was cartoonist. A cartoon of his was published in The Judge. He is credited with Charley the Chump and Looney Land (1926 Wheeler-Nicholson dailies) [Allan's note: Charley the Chump has not yet been found appearing in any newspaper; Looney Land has, but just barely, with a little over a week's worth printed in Lowell Sun]. Strange sounds from the roof of a tavern at 2969 San Pablo Avenue aroused James Navoni, 2937 [sic] San Pablo Avenue, early today and soon led to the arrest of George Fava, 31, 3213 Filbert Street. Police Sergeant J.J. Reichel said he found Fava on top of the tavern roof, with the skylight removed and a knotted length of rope stretching through it from the roof to the floor. Fava wore socks on his hands as gloves and admitted, the officer said, he had intended to rob the tavern. Navoni signed his World War II draft card on April 27, 1942. He lived at 2973 San Pablo Avenue and was a store owner. He passed away on April 19, 1975, in Napa, according to the California Death Index. Thank you for this piece on Jim Navoni. I was happy to find it when doing a search. Jim Navoni is my great uncle, brother of my grandmother Johanna Navoni Lytjen. 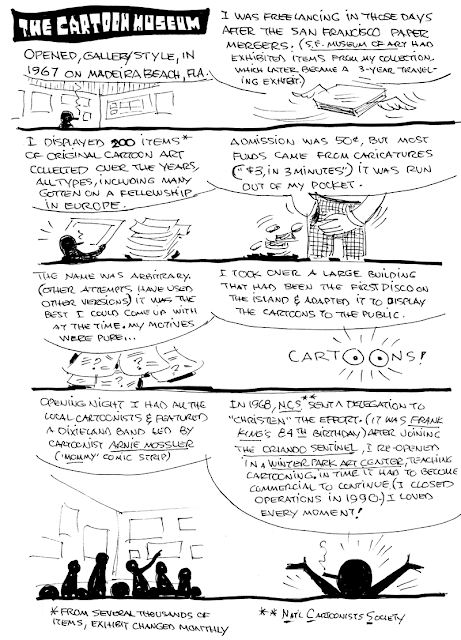 I am wondering if you have more information on his years in New York cartooning. Herbert Morton Stoops was born in Parowan, Utah on May 28, 1887. His place of birth was recorded on his World War I draft card and on two passenger ship lists at Ancestry.com. The year of his birth was recorded as 1887 in the 1900 U.S. Federal Census and his World War II draft card. His first World War draft card had the year 1888. The Presbyterian Ministerial Directory, 1898 recorded the Stoops family living in Salina, Utah as late as 1892. The date of their move to Idaho is not known. In the 1900 census, Stoops was the oldest of five children born to Philip Dexter Stoops and Eliza (Lila G. Morton). His father, a ranch employee, was doing home missionary work in Utah since 1881, according to the Biographical Record of the Alumni of Amherst College, 1821- (1901). The family lived in Kilgore, Idaho. Some time after the census, his mother moved the children to Logan, Utah. The Salt Lake Herald (Utah) reported, on May 12, 1903, that Stoops had graduated from the New Jersey academy of Logan. 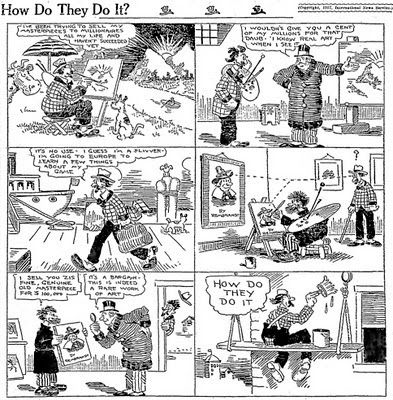 The budding cartoonist was noted in the Deseret Evening News (Utah) on November 28, 1903, "Prof. Stutterd…is…developing a cartoonist in the person of Herbert Stoops. 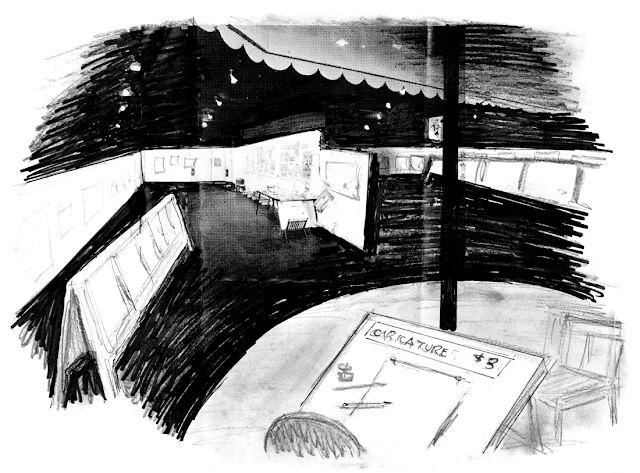 Some very credible work from the pen of Mr. Stoops appeared in the last issue of Student Life." Herbert M. Stoops leaves today for San Francisco, where he will probably be employed by the Pacific Construction Co., with which Mark Pendleton, formerly of Logan, is now associated. Young Stoops, who undoubtably has marked ability as a cartoonist, goes to San Francisco that he may have opportunity to attend an art school there at spare times. He is a fine young fellow with many friends here who wish him well. An update was published on December 7, "Herbert Stoops is located at Berkeley, Cal., rather than San Francisco as originally intended. He is employed in a book store, attends a night school for art students, and is living with the Stovers, formerly of this city." It continued to chart his progress in this March 14, 1908 report. Herbert M. Stoops, formerly of Logan and the "Student Life" staff, is doing things out in San Francisco, where he spent last fall. In recent issues of The Bulletin, one of the Golden Gate city's big papers, he has had two cartoons, and just other day came near winning a big prize offered for the best cartoon welcoming the fleet of battleships soon to arrive there [you've read about this event in our Herriman Saturdays as well -- Allan]. Out of ninety cartoons submitted, twelve were considered very satisfactory and of these one was by our own Herbert M. Stoops. A closer grading than this is sufficient to show that the confidence and expectations of Herbert's friends is not misplaced. Some day Logan will be glad to say that she know Stoops. Too much can not be said in praise of the annual newspaper artist's exhibition now going on in the red room of the St. Francis. In many respects it is the most interesting of the year not only because of the divers talent displayed, but also because of the wide range and scope of subject and of style done in pencil and brush, in water color or oils, in pastel or charcoal as the fancy of the artist suggested. Nearly all of the local newspaper artists are included in the list of exhibitors, among them being T. Langguth, Walter Francis, S.C. Armstrong, M. Lustig, M. Del Mue, Lafayette Houchin, G.C. Stanton, J.A. Cahill, Leroy Ripley [Robert "Believe It or Not" Ripley], A.L Scherzer, Herbert M. Stoops, Ray C. Schulmann, Randal William Borough, John C. Terry, Paul Terry, V. Nahl, J.H. Litchfield, Stanley F. McNeill, Dan Sweeney, Percy Gray, M. Spero, W.R. de Lappe, Sylvan Schuhl, L.J. Rogers, H.R. Chapin, G.A. Bronstrup, R.C. Westover [Russ "Tillie the Toiler" Westover] and F.O. Fleming. Stoops was counted twice in the 1910 census. He "lived" with his mother and siblings in Logan, Utah at 126 South Second East. He was an artist at a newspaper. The whereabouts of his father has not been determined. In San Francisco, California Stoops was a lodger at 428 Broderick Street; he worked as a newspaper artist. The Arts Magazine (Volume 22, 1947) obituary said, "…he worked as feature artist on the Morning Call and later joined the Examiner, along with Maynard Dixon and Harry Raleigh." The Society of illustrators named the San Francisco Chronicle as one of his employers in 1910, but that seems unlikely, in my opinion. Stoops provided art for a Valentine's Day card produced by the Paul Elder & Company. The Call, January 29, 1911 said, "Cupid will be featured in a biplane…One of the prettiest designs…depicts the winged messenger of love as an aviator bearing a captivating young miss as a passenger…." Later that year on June 20, The Call published his cartoon on law breaking at beach resorts. 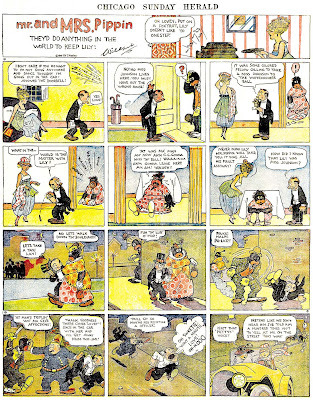 He was one of several artists to do the local strip Alonzo; his stint was in 1912 from June to September. When Stoops worked at the San Francisco Examiner has not been determined. There are two different dates for his move to Chicago. He moved in 1914, according to the Society of Illustrators, "where he took classes at the Art Institute while working as a staff artist for the Chicago Tribune." Arts Magazine said, "In 1916 he became part of that great Chicago group that included, among others, McClelland Barclay, Ben Hecht and Charles MacArthur." In American Art Analog: 1874-1930, Michael David Zellman said 1916 was the year Stoops moved. He signed his World War I draft card on June 5, 1917. He lived at 4950 Kenmore Avenue and worked as an artist for the Daily Tribune. His description was medium height and build with blue eyes and light brown hair. 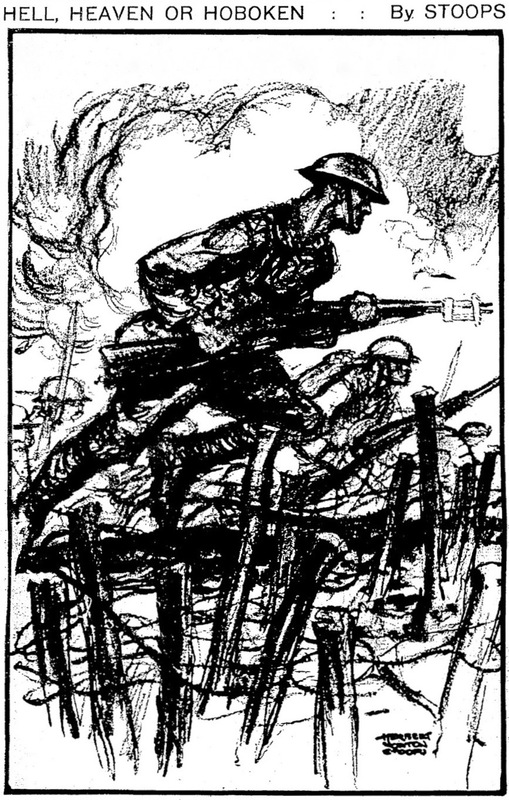 The Society of Illustrators said, "…the…artist enlisted in the Army, serving in France as First Lieutenant in the Sixth Field Artillery of the First Division. Stoops sent drawings from his sketchbook back to the home front…." [Stoops caption] "To two of the three musketeers of the western front—the Englishman and the Frenchman (to whom the war is familiar)—the landscape is flat and the sky uninteresting save when dotted with aircraft; but to the third—the Yank‚every battered landmark spells history, and the heavens above France sing of the romance of the sky." [caption] The doughboys, in their event rushes "over the top," shouted this slogan, singularly free from cant or hypocrisy. Mr. Stoops, who drew this vivid sketch, is a Chicago newspaper artist who went to the front. He was wounded in action. Fort Riley, Kan.—A brash young lieutenant of World War I artillery is responsible for the present shoulder patch of the First Infantry Division, rotated here from Germany under Operation Gyroscope—the "BIG RED ONE" on the olive-drab background. The World War I version of this patch has the same color combination but the numeral, worn on the left sleeve, extended from the shoulder almost to the elbow. Lieutenant Herbert Stoops of Battery C, Sixth Field Artillery, saw the oversized numeral on his commanding officer's shoulder and remarked that it looked like the colonel's red underwear showing through a wire-rip. The colonel had a sense of humor and gave his junior officer no rebuke other than to tell him to come with a better design—or shut up. The lieutenant did. Clipping a piece of red piping from a German infantry officer's cap, he fashioned a "one" and placed it against the gray mass of the cap. The design was approved with the substitution of olive drab for the German gray. The only source of the gray cloth would be German uniforms and no one imagined that Germans were going to surrender just to provide First Division patches. The division's distinctive emblem was officially recognized on October 28, 1918. However, the first "members" of the outfit to wear the "BIG RED ONE" were the trucks, not the men. In February, 1918, some unknown doughboy put the numerals there to distinguish U.S. Army from British vehicles in the same area. The Society of Illustrators said, "After the war, Stoops moved to New York City and married Elise Borough. Under the tutelage of Harvey Dunn, Stoops applied his early experiences to canvas and paper, becoming one of the most sought-after illustrators of his day. By the early '20s, oils by Stoops were featured in Cosmopolitan and Good Housekeeping alongside the works of illustration giants. He began painting covers for The American Legion Magazine, a publication for which he would work constantly in the years to come." Stoops has not been found in the 1920 census. In January 1925 Stoops and his wife returned from Bermuda. The passenger list recorded their New York City address as 10 East 9th Street. His mother passed away on September 23, 1925. On the same day, a death notice was published in the Oakland Tribune. She was survived by her husband and five children. The Amherst Graduates' Quarterly (Volume 16, 1926) noted the whereabouts of his father, "Philip Dexter Stoops, whose name has for some years been unaccountably omitted from the Address List, is living at Mason's Island, Mystic, Conn." The date of his death is not known. 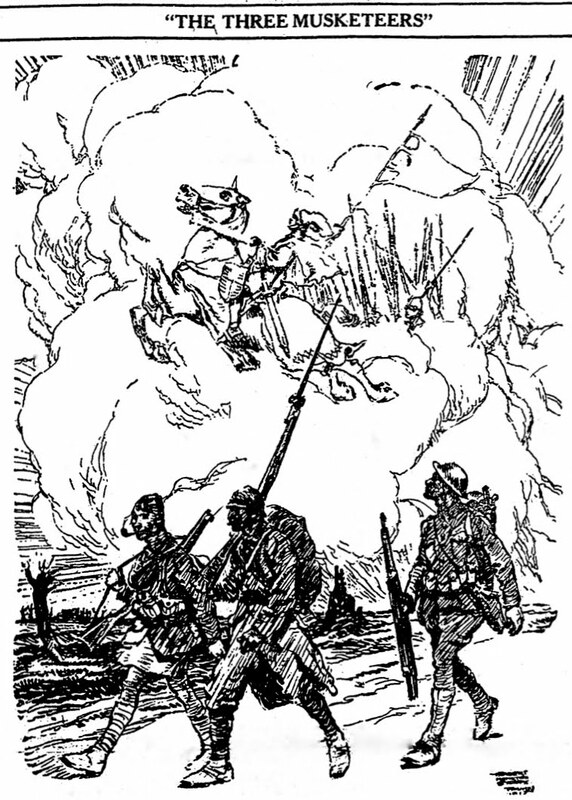 After the [first world] war, Stoops began his illustration career and his association with Blue Book. He did not confine himself to those pages alone; he illustrated for Collier's, This Week, Cosmopolitan, and many others, as well as painting for exhibition. His picture. "Anno Domini." won the Isador Medal at the National Academy Exhibition in 1940. Stoops' drawings and paintings were exhibited in the Society of Mystic Artists exhibitions in Mystic, Connecticut, where his father once lived. The Springfield Republican (Massachusetts), on August 31, 1941, wrote, "Herbert M. Stoops presents a powerful portrayal of human misery in war called 'Current History.' " On August 2, 1942, the Republican said, " 'Chalk Cliffs,' by Herbert M. Stoops, is a dignified and decorative record of watchers against a searchlight-sprayed night sky." He signed his World War II draft card on April 25, 1942. The self-employed artist lived at 42 Barrow Street in New York City. His description was "5'9", 160 [lbs]" with blue eyes and gray hair. "During World War II he did several posters for the office of War Information," according to the Society of Illustrators. Stoops passed away at his Greenwich Village home on May 19, 1948. The New York Times reported his death the next day. More profiles can be read at AskArt.com, Pulp Artists (photo of Stoops), and Arts Magazine. In American Illustration, 1890-1925: Romance, Adventure & Suspense (1986), Judy L. Larson wrote, "He signed his work either 'Raymond Sisley' or 'Jeremy Cannon.' "
According to pulpartists.com site, Raymond Sisley and Stoops were two different people; although, they once worked together in the same art studio.